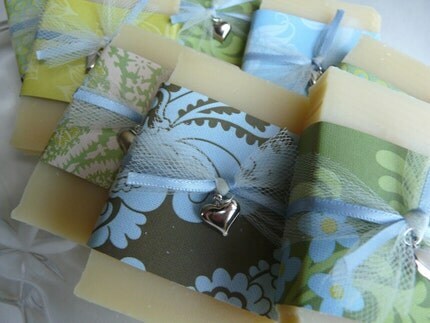 I'm partial to edible wedding favors (for obvious reasons), but these handmade soap favors by mbeasoap are a great inspirations for a DIY bride. A few charms, some ribbon, and papers in various pattens to match your event's aesthetic would be a simple afternoon project. You could even take it a step further and get funky with the soap. LUSH has some great looking options. This Waylander Rhassoul soap would look amazing wrapped in cream-colored papers and tied with teal, raspberry, or bright orange ribbon. There are a few LUSH locations in The Cities (MOA, on Nicollet, and in most Macy's in the metro).